Cappella Aquensis was formed in 1963 by a splitting of the Aachen Cathedral Choir. 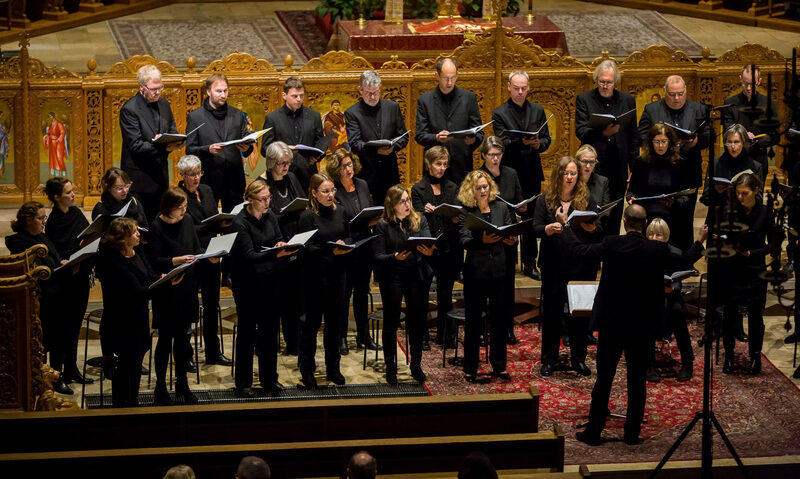 As a free concert choir with about 45 members, we have an extensive repertoire of secular and religious choral music. We perform not only ambitious and international a-cappella music from the Renaissance all the way to the modern era (ca. twice a year), but also large orchestral oratories and masses (every 2 years). In contrast to most other choirs in and around Aachen, we provide the musical accompaniment to High Mass in Aachen Cathedral – singing Latin masses and motets – about 3-4 times per year. In addition, we regularly travel with the choir to perform elsewhere, both in Germany and abroad. We are currently planning a trip to Cambridge, UK in 2019. Since January 2018, Ulrich Brassel is our new Choral Director. Find out more about our past in the category ‘Our History’.